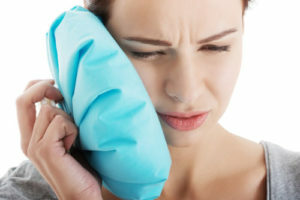 Jaw pain is most commonly caused by muscular spasm, usually a result of clenching or grinding. This could be occurring during the day or in your sleep without you knowing. The recommended treatment is seeing a physiotherapist who specialises in head, neck and jaw pain. You can also try some nurofen and a heat pack on the side of your face to allow the muscles to relax. If you are concerned about any symptoms you are experiencing always see your Dentist for a professional opinion.